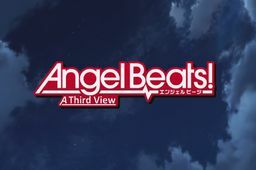 A third view is based around a character called Inochi Ushina who isn't in the SSS, the character plays the role as someone who sees the Angel Beats! story from a third person perspective. Unlike everyone else he isn't one to believe in God, and has ‘regretted something he would never forgive himself for in his past life. The story basically goes through the whole Angel Beats! main story line in the background etc, as he tries to live his life like normal in that world. 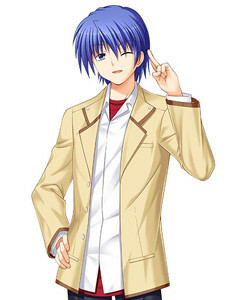 Hinata is a bright, dependable boy who is the closest to Otonashi. He always tries to save his friends if he can and is a reliable force in the team. <hidden by spoiler settings>He and Yui constantly irritate one another on a daily basis, but deep down, he cares for Yui, as shown when he helps her pass on by telling her he would marry her. 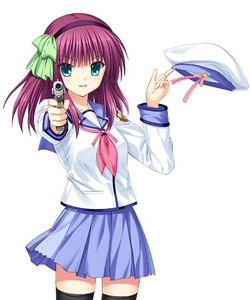 Nakamura Yuri, also known as Yurippe (ゆりっぺ), has a determined personality but is secretly very sensitive and protective. 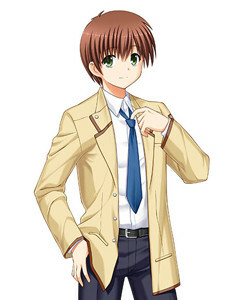 She invites Otonashi to join the SSS, an organization she founded and leads which fights against God. She is smart and decisive when making operations and decisions. She carries a silver Beretta 92. Not only is she skilled with a gun, but she is also capable in close range hand-to-hand combat, which is shown when she fends off Angel's hand sonic with a combat knife. 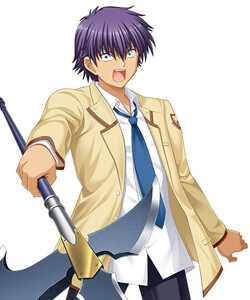 Otonashi is the main protagonist of Angel Beats!. Due to his past, he has a caring personality and does not want anyone to experience pain or sadness. <hidden by spoiler settings>He lost his memory after his death in a train accident. 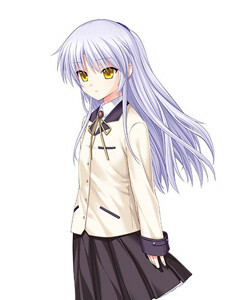 Kanade is the student council president at the afterlife school. This places her at odds with the SSS as her responsibilities require her to suppress delinquency and other disruptive activities that the team does. The SSS initially calls her "Tenshi" since they do not know her real name. It is difficult to understand what she is thinking due to her rarely showing any outward emotions and her way of talking bluntly. Her favourite food is Mapo Tofu. Noda is a self-reliant boy who executes the strategies formed by the SSS and fights with a halberd. He does not listen to anyone other than Yuri, for whom he has adoration, and is antagonistic to almost everyone else. He has a one-sided rivalry with Otonashi. He is a complete idiot whose weakness is education; at one point, Takeyama is able to knock him out by reciting pi. He is not afraid to harm or kill anyone who gets in Yuri's way. Though he prefers to fight with his halberd, he sometimes uses guns out of necessity, the type of weaponry that he hates. Ooyama is an ordinary boy who has no special talents. He does not excel at anything, but is as capable as any normal person; in other words, he is a Jack of all trades. 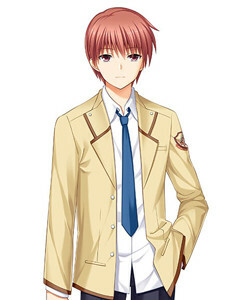 He is an innocent boy whose feelings are hurt from things like making fake confession or watching his teammates "die".